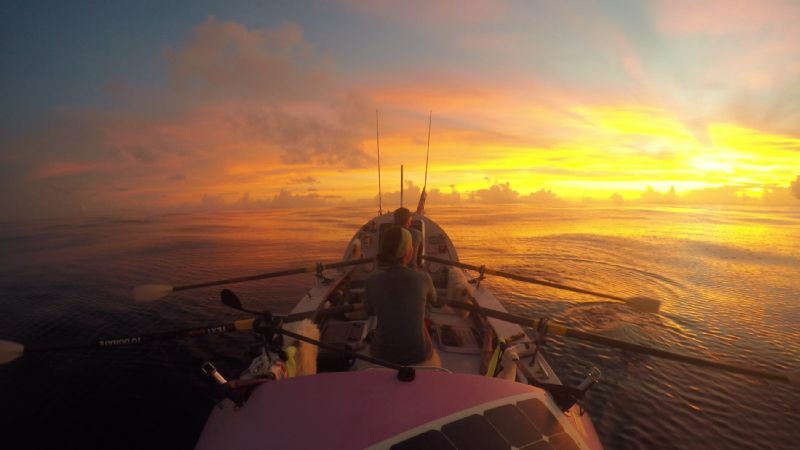 Two members of the Coxless Crew take in the sunset on the Pacific Ocean. Their pink Rossiter row boat is 29-feet-long and 7-feet-wide. It's made mainly of carbon fiber and named Doris. Last April, four women set out to row across the Pacific Ocean, an 8,446-mile journey from the U.S. to Australia. It's nine months later, and Natalia Cohen, Laura Penhaul, Emma Mitchell and Meg Dyos are expected to reach land Jan. 24. 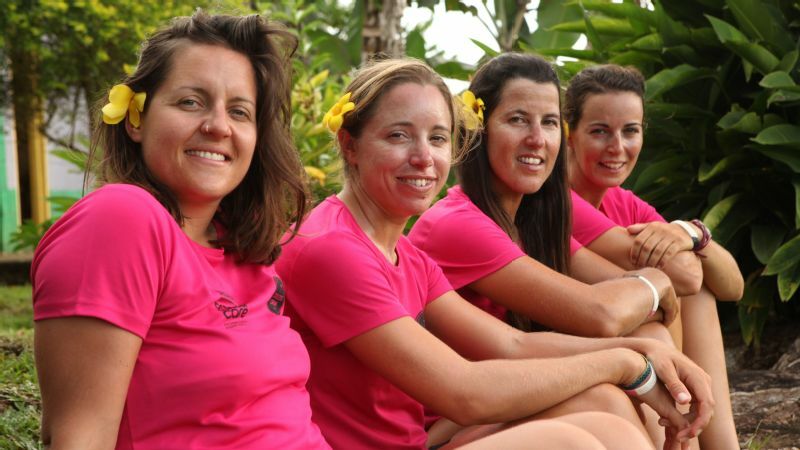 Their aim is to be the first all-female team to row the Pacific, and they're raising money for breast cancer survivors and wounded servicewomen. Many of them had never rowed before this journey. Needless to say, we had some questions about their endeavor. Nine months. Rowing the Pacific Ocean. Cramped quarters. 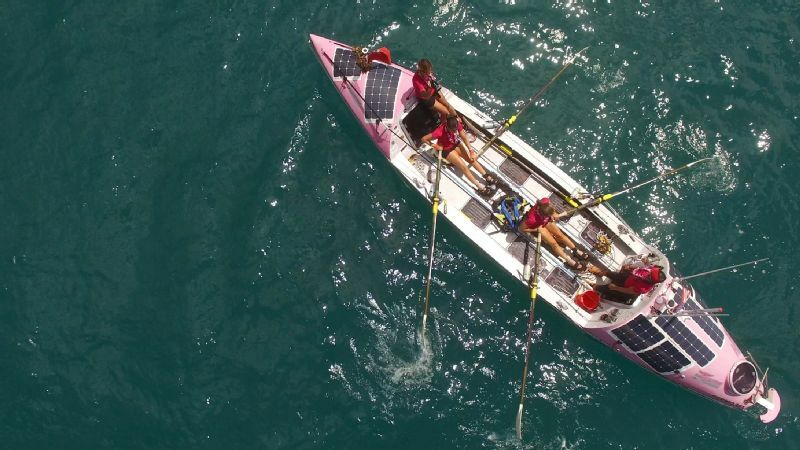 The U.K.-based Coxless Crew e-mailed us their answers from their pink 29-foot rowboat named Doris. espnW: Whose idea was this initially, and how did everyone else react when they first heard it? Penhaul: Originally I had joined someone else who was looking to put a team together to row the Indian Ocean. 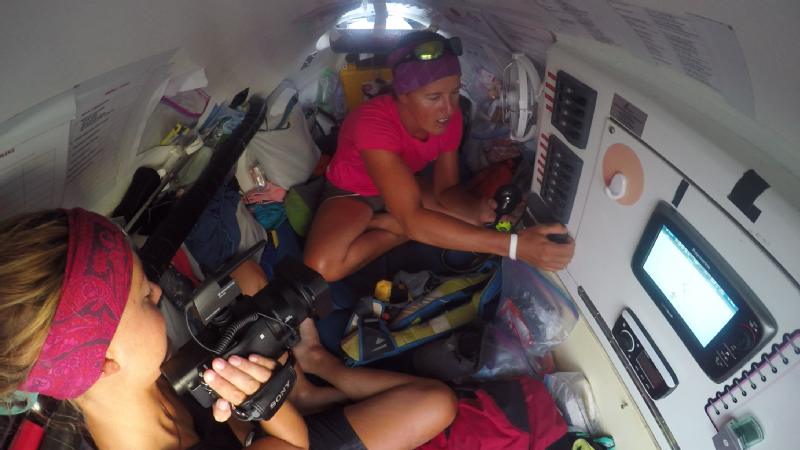 Preparing for an expedition that's not been done before, and would take more than six months, takes a lot of commitment and sacrifice, so when the Indian Ocean row of approximately 2,500 nautical miles developed into the Pacific row -- which was going to be about 8,000 nautical miles -- the original idea creator realized she couldn't commit to the journey and pulled out. I was totally immersed in the project by this point, and therefore continued to develop it into the Coxless Crew. After a process of team recruitment, the team you see today came together and brought the row to the start line. Peoples' reactions to the row have always been mixed, but 90 percent of the time we would hear the phrase, "Are you crazy?!" I think a lot of people struggled to get their head around the enormity of the project, but those who have, have given us a great deal of support. Our parents, who at the beginning understandably were full of worry and fear, have become totally involved in the row and are our No. 1 support crew. From left, Meg Dyos, Emma Mitchell, Natalia Cohen and Laura Penhaul. The women started their three-leg journey in April in San Francisco, California, and rowed 3,028 miles to Hawaii. Then they rowed 2,608 miles to Samoa. They are now on their final strait of 2,810 miles to Cairns, Australia. How did you prepare physically and mentally? How far in advance did you start training? Penhaul: Both physical and mental preparation were of equal importance and started as soon as a member got engaged in the row. Alex Wolf is the head strength and conditioning coach for the English Institute of Sport and had worked with GB Rowing for more than five years. Thankfully he kindly volunteered his expertise, assessing us in the gym, writing our programs and nutritional plans, reviewing us and testing us to check on our improvements. Keith Goddard has also been invaluable. Keith has been our sport psychologist, and I honestly think we wouldn't be the strong team we are without his involvement. We have worked on personality traits, coping strategies, stress testing, conflict management, reflections, how to get the best out of each other and understand our hot buttons. In combination with this we worked with an ex-army company called Fieri, that combined both physical and mental stress testing with a 48-hour sleep deprivation challenge. Were you athletes beforehand? What did you do? Mitchell: I started rowing at my local town rowing club when I was 16 and have been rowing ever since -- including getting a blue [ribbon] for rowing the boat race while at Cambridge. However, rowing on an ocean is an entirely different thing to rowing on a river. Penhaul: I have worked in sports for more than 10 years and am currently a physio at British Athletics. Although I'm not a competitive athlete, having worked in the environment for many years I understand what the body needs to stay resilient in extreme environments. Outside of work, I'm a keen amateur triathlete and marathon runner, and I enjoy 24-hour cycle sportives and skiing. Before starting this project, I had never rowed before. Cohen: Tennis used to be my main sport, and now I do a lot of long distance swimming. I had never rowed before this expedition. Dyos: I learned to row the day before we left Samoa and had never stepped foot on a rowing boat until then too. I have completed different challenges such as running a marathon and climbing [Mount] Kilimanjaro, but I am not an athlete by any stretch of the imagination. Cramped quarters inside the small cabin. Dyos: We eat predominantly freeze-dried foods that require hot water to be added. They range from spaghetti carbonara to chicken tikka masala, and they're actually pretty delicious. However, the monotony of eating the same foods on a daily basis takes its toll. We also have snack packs of biscuits and sweets that we take out onto the oars, breakfasts made up of muesli and porridge and desserts of rice pudding and chocolate chip. Where is your food stored? Dyos: Our food is stored in the outside deck hatches. Because they are light and freeze dried, they don't take up too much space. How do you stay mentally engaged? Mitchell: I try to spend at least a part of each row shift taking in my surroundings, the ever-changing ocean, the sky and the wildlife and appreciate how few people will ever experience this. Also stories, games, music and audio books all help to keep us engaged and interested. Penhaul: I tend to do a session a day where I focus on row technique. The rest of the time I'm thinking about location, track and navigation. Otherwise, we use a number of distraction techniques as a team. I also spend the majority of my time thinking of my family and friends back home, day-dreaming about life after the row. Cohen: I focus on staying in the moment as much as possible, observing all movements of the ocean, sky and wildlife surrounding us, and finding pleasure in the small things. We have told each other our life stories, debated every subject we can think of, narrated films, played word games and listened to music and audio books to keep us mentally alert. Dyos: I talk to myself using words of encouragement and motivating quotes. I also have images in my mind that I visualize -- they range from envisioning the finish to picturing the charities that we are raising money for. For me, music is also a massive tool for staying mentally engaged. Was there ever a time someone was unable to do their shift? How did you manage? Crew: No. Knock on wood, this hasn't happened so far. Everyone has always pushed through sea sickness, pain, tiredness and frustration and rowed regardless. The boat has two rowing positions and a front and back cabin so that the women can row and rest in shifts. Was there ever a moment you said, "That's it -- we're turning around." Penhaul: Ten days after leaving San Francisco and after experiencing some of the biggest seas we've seen this whole journey, we found flooding in our battery hatch. The batteries themselves were thankfully fine, but the charge controllers (controls the solar panel power into the batteries) had become water logged and failed. They overheated and melted, and if they hadn't been in a sealed container it would have led to a wider spread fire, which would have been catastrophic. We evacuated the cabin immediately with all our emergency gear, then spent the night rotating between two people sitting out on deck in the freezing cold while the other two warmed up in the forecabin. Two hours on, two hours off. I think I can safely say that felt like the longest night. When daylight came we could properly assess the damage and it was at this point that the team decision was made to have to turn back to America and stop in Santa Barbara to fix everything before restarting the row. Not quite the planned start we had imagined. What will you do when you reach land? Dyos: Give my Mum a massive hug! Cohen: As a team we will be stepping off the boat together and then hugging our amazingly supportive parents. Then a huge meal, a long shower and crawling into a comfy bed for a long sleep sounds good to me! Penhaul: Cry with my wonderful family who have been such a huge support throughout. Then proceed to celebrate with food, martinis, a good long shower, washing my hair and sleep in a big comfy bed without setting an alarm! What will your first meal be? Dyos: I have craved an avocado salad for weeks. Or anything that involves hummus. Mitchell: I am looking forward to a big Australian barbecue with lots of fresh salad and then some fresh fruit and frozen yogurt for dessert. Cohen: I'll go for the same as Em please. Can't wait for fresh food! Penhaul: I would love a grilled steak and some sweet potato fries, followed by frozen yogurt. Be honest: anything about the other rowers that's driving you batty? Cohen: I don't think we would be human if after nine months of being constantly sleep deprived and in such a confined and extreme environment, we didn't drive each other a little crazy. We live through the same 24-hour existence, which is not normal for anyone. It's not surprising that one of our biggest, and most random arguments was concerning a packet of instant noodles. Luckily, when we do annoy each other, the best thing about our team is that we are open and honest, we share our views and then let go of all negative feelings instantly.